When clicking the wrong link led Spokane resident Kirsten Schierman to the Chocolate Challenge Contest at DisneyFamily.com, it was like someone cooked up a challenge with her in mind. She succeeded with her Organic Double Chocolate Huckleberry Cheesecake, which won the grand prize, a $2,000 gift certificate to the kitchen store Williams-Sonoma. Creating a new recipe, says Schierman, “is an art – combining flavors, looking for the whole palette picture.” She chose ingredients based on their taste, texture, distinctiveness and presentation. The huckleberries, she says, have the Northwest flavor but are considered exotic in other locales. Organic ingredients were a natural selection because she already cooks and bakes organically for her family of five. And the two kinds of fair trade chocolate, purchased at Fresh Abundance, met the contest’s chocolate challenge while making the dessert both decadently rich and beautiful on the cake plate. 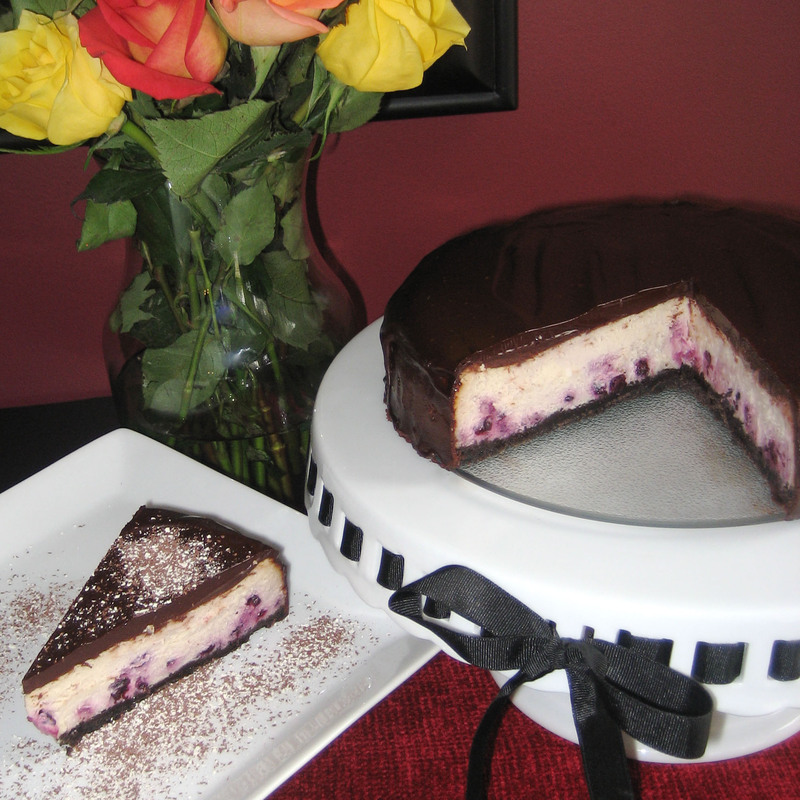 After about 20 hours of research and rumination Schierman made the cheesecake just once for Valentine’s Day. “I baked it in my head over and over and over,” she says, adding that it turned out perfect and earned rave reviews from the few cherished family and friends who savored a sample. Some of her cheesecake tricks, she says, include putting a muffin tin full of water in the bottom of the oven to keep it humid and waiting until the cheesecake has a jiggly consistency before opening the oven door. “Do not open the oven door during cooking,” she stresses, adding that the cheesecake should cool slowly, so when it looks done and is firm, not soupy, she turns off the oven and opens the door, removing it after about 30 minutes to finish cooling. Schierman makes this cheesecake with organic ingredients, but it can be made with conventional products. If huckleberries are not available, she suggests substituting the berries of your choice. Butter a 9-inch springform pan. Mix crushed cookies with melted butter and press into bottom of pan. Bake at 350 degrees for 15 minutes. Remove to wire rack to cool. With microplane grater, grate a few tablespoons of each white and dark chocolate. Reserve for garnish. Lower oven temperature to 325 degrees. Place muffin tin filled with water on the bottom rack of oven. Gently melt white chocolate in double boiler with cream. Turn off heat when melted, but keep over hot water. Using a high-speed mixer, beat cream cheese just until creamy. Stir cornstarch into sugar and then add both to cream cheese. Add eggs one at a time and beat, then add almond extract, vanilla and salt, beating and scraping down sides. With mixer on medium speed, slowly pour in melted white chocolate. Beat on medium just until mixed and creamy. Fold in huckleberries by hand, leaving swirls. Pour into cooled chocolate crust. Bake for 65 minutes without opening oven door. Turn oven off and crack door open, leave for 30 minutes more before removing to wire rack to cool. Run a thin-bladed knife around the edge of the cheesecake to loosen it from the side of the pan. Place covered in fridge overnight to cool (or at least a few hours). When cheesecake has cooled, remove the side of the springform pan. Set wire rack over a flat baking sheet, and cheesecake on the wire rack. Put dark chocolate pieces in a bowl. Heat cream, corn syrup and salt in a small saucepan (or double boiler). Heat mixture until it starts to boil, stirring constantly. Pour hot cream mixture over chocolate. Let the mixture stand for 30 seconds to melt the chocolate. Gently whisk until smooth. Stir in Chambord and vanilla. Pour warm truffle glaze over cheesecake, coating top and sides completely. Keep the cheesecake chilled until ready to slice and serve. To serve: Cut cheesecake with a sharp thin-bladed knife, dipping the blade in hot water and wiping it dry after each slice. Sprinkle each slice with white and dark chocolate shavings. Contact correspondent Jill Barville by e-mail at jbarville@msn.com.